Composed from the HE TU, the legend tells that this diagram appeared to Sage FU XI (2943 years before our era), drawn on the back of a dragon-horse which left the Yellow River.He devised the eight trigrams, in order to gain mastery over the world. In classical Feng Shui, the He Tu combination of numbers embody the YIN and YANG pairings of the five elements. The He Tu numbers are derived from the Map of compass primary directions; North, South, East and West are represented by a He Tu pair of numbers. In addition to the above four pairs of numbers, 5 & 10 are said to represent earth energy residing in the centre. The odd numbers are YANG numbers, while the even numbers are YIN numbers. The He Tu pattern is illustrated in the diagram shown below. 1 and 6 are water elements. 2 and 7 are fire elements. 3 and 8 are wood elements. 4 and 9 are metal elements. Running in a clockwise direction starting from the centre (Earth), the combinations flow as in the Productive cycle; Earth [5 & 10] produces Metal [4 & 9], Metal produces Water [1 & 6], Water nourishes Wood [3 & 8], Wood nourishes Fire [2 & 7], Fire produces Earth. Traditionally, Fuxi is considered the originator of the I Ching (also known as the Yi Jing), which work is attributed to his reading of the He Map (or the Yellow River Map). 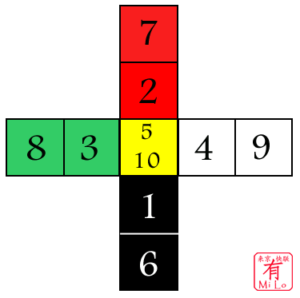 According to this tradition, Fuxi had the arrangement of the trigrams (八卦 bāgùa) of the I Ching revealed to him in the markings on the back of a mythical dragon horse (sometimes said to be a tortoise) that emerged from the Luo River. This arrangement precedes the compilation of the I Ching during the Zhou dynasty. This discovery is said to have been the origin of calligraphy. Fuxi taught his subjects to cook, to fish with nets, and to hunt with weapons made of bone, wood, or bamboo. He instituted marriage.